No excuses. It has been too long since I last posted. I have been accepted to the Master of Educational Technology at the University of British Columbia. The decision was not made lightly. Although I am very excited to start this new phase of my learning, I still have mixed feelings about pursing graduate studies. This post is a personal reflection on the reasons that previously kept me from pursuing graduate studies and two events that influenced my decision to apply. I have never, until recently, considered myself gradate student material. The first year in my undergraduate studies was more social life than academic pursuit. Even the courses I signed up for were all over: economics, sociology, calculus, accounting, film study, and drama. The readings seemed obscure; I had no life experience to map the content to the world of my 17 years. After a year on academic probation, I decided to finish my degree part-time and find a job. It was the best decision. Learning on-the-job has always been more meaningful. From my first job and the corrections to my inter-office memos made sense unlike the TA scratches on my university papers. Having to understand a cash flow is much more meaningful when I need to be sure everyone I work with gets paid and there are real world consequences unlike the fake cash flows on accounting exams. I am fortunate to have a job that allows me to continue purposeful learning. I have cultivated a personal learning network that satisfies my learning needs and interests. My colleagues are consummate learners and our discussions are challenging and inspiring. Collegiality is shared through various networks that I follow and/or participate. The scholarship found in these global communities is the same found on any university campus. A graduate degree has never been a motive; it is a costly commitment and until now I have not seen the value of having this degree listed on my resume. However, here I find myself in a Master program, because of the an unexpected environmental change and another serendipitous event. I work for a not-for-profit agency and there has been external factors affecting funding for the sector. The uncertainty of employment required a quick scan of job opportunities. Every posting, for positions I would consider, required a Masters degree. I could not depend on work experience and non-formal/informal learning to provide entree to employment. An extremely vulnerable position to be without means for a satisfying livelihood. Luckily, an unexpected tweet led me to an educational shift in my previous thinking. 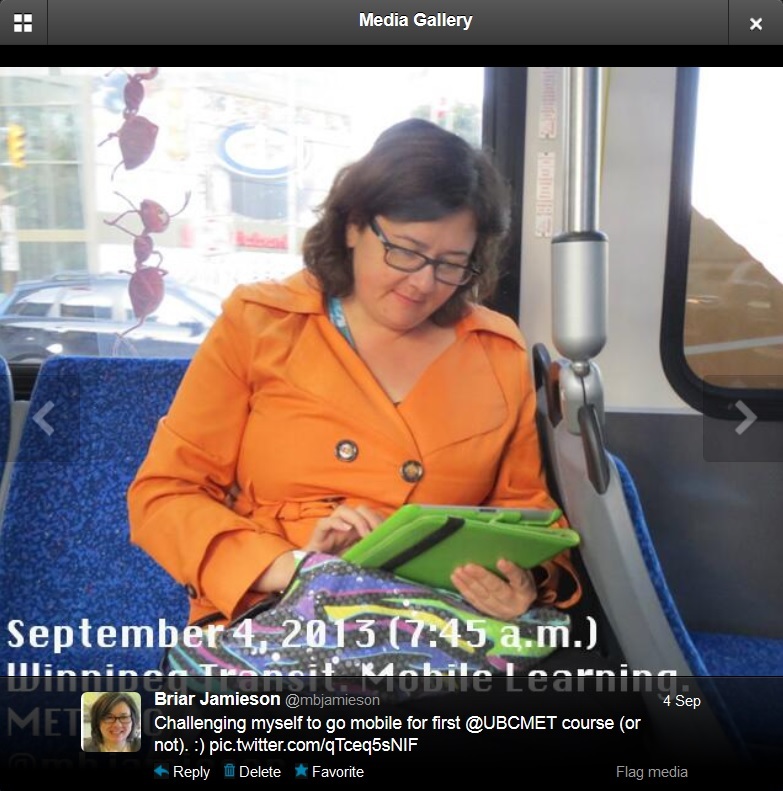 In January 2013, I participated in the Open Learning Design Studio’s MOOC: Learning Design for a 21st Century Curriculum. It was my first active participation in a MOOC (I had been a passive participant in several before). The activities, discussions, readings, expertise and accessibility of academics led to a deeply transformational learning experience. For the first weeks, I slept very little, reading and absorbing every recommended reading. Pathways to these materials was something that I was missing from my own autonomous learning. I also saw myself as someone that could consume ‘academic’ articles and contribute to the discussions. My internal fears of being capable for graduate studies was reduced. The first week of my Master’s journey began this week. As this new journey begins, I already find myself relying on the values and lessons learnt from my belief in autonomous, applied, connected and personalized learning to support me through these first weeks. Make time. Learn technology. Find resources. Connect with cohort. Drink coffee. Tweet. Reflect. Blog. . Share…sleep…zzzz…. Great post, Briar. Good luck with your studies!